Global stock markets are under pressure and oil prices are rising to fresh 9-month highs as markets begin the final week of a record setting first half of 2014. 1. Oil prices strengthening: Crude oil prices rose Monday as investors worry about militants taking over large parts of Iraq. The country, which is a major oil producer, has been thrown into an intensifying conflict as members of the militant group ISIS battle with Iraq forces. Dominique Barbet, an economist at BNP Paribas, said rising energy prices "will not only add to the production cost of industry, but also put pressure on households' purchasing power," after new data showed the manufacturing and services sector in France continued to slow. 2. Stocks sliding: Rising oil prices are not helping market sentiment. 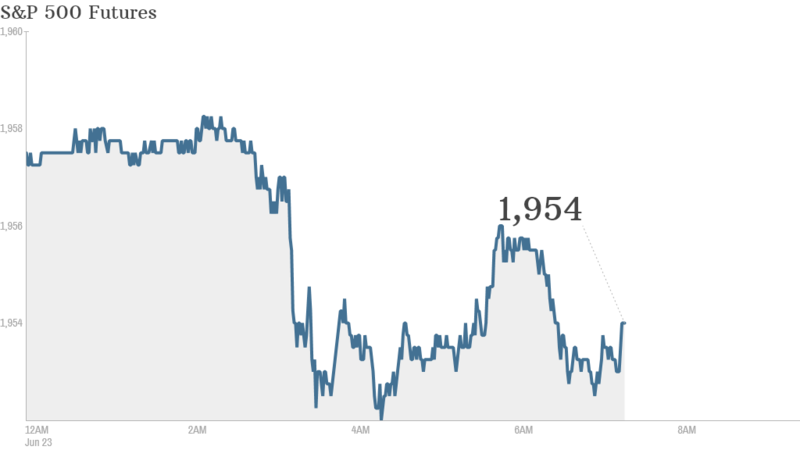 U.S. stock futures were weak ahead of the open and European markets were all in the red. Asian markets ended with mixed results despite the strongest reading of Chinese manufacturing activity in seven months. 3. An American in France: Shares in General Electric (GE) were getting a slight boost in premarket trading after Alstom (ALSMY) agreed to sell its energy operations to the U.S group, under a revised proposal that gives the French government a minority stake in some parts of the business. The original proposal had faced opposition from some French politicians worried about GE taking control of critical French infrastructure. Alstom said the new deal would give the French government "veto [powers] and other governance rights over issues relating to security and nuclear plant technology in France." 4. Economic announcements: Investors are awaiting U.S. existing home sales figures to be posted at 10 a.m. ET. The monthly data will give an indication of how the real estate market fared in May. 5. Friday recap: U.S. stocks closed higher Friday. The S&P 500 and the Dow Jones Industrial Average both broke records, while the Nasdaq also made gains. At the close on Friday, the Dow was about 50 points away from crossing 17,000 for the first time ever. Friday marked the Dow's 11th record close for the year.